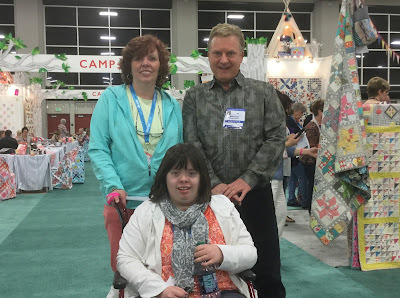 So today I am entering Quilt Market 2016. We are at the Salt Palace in Salt Lake City, Utah. This is the second time I have been here. This year it looks like the color of the day is orange. Does anyone recognize this group? I do not know them, but we are all wearing orange today, even the security guy. Do you see him? This is a big place so my mom pushes me in my transport chair so I don't get too tired and have trouble breathing. There is so much to do here I don't know what to do first. This looks like a good place to start. I love these big quilting machines. This is a Simply Sixteen by HandiQuilter. It is like driving a car. I think I want one of these machines for my birthday. Oh it is so fun to run into Debra Gabel. We first met in Houston when we got stranded because a hurricane was going up the east coast. She came and hung out in our room for awhile. 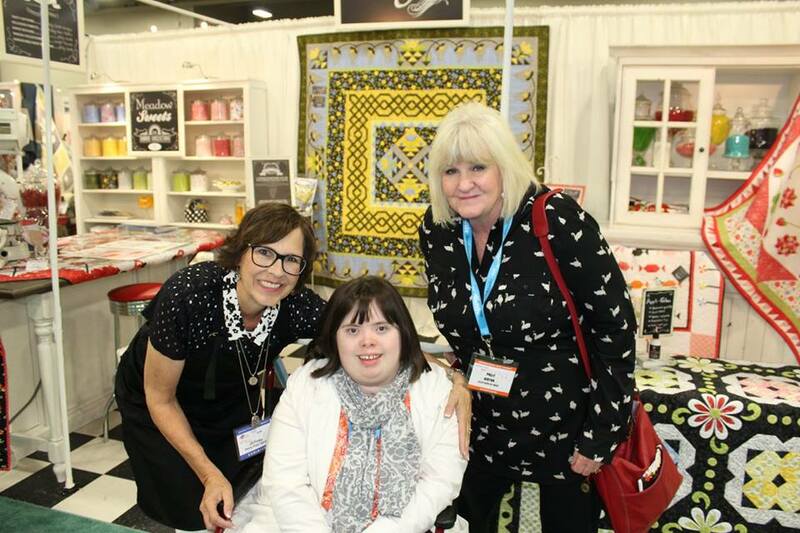 She creates the license plates we sell for the Row by Row Experience in her Zebra Patterns studio. Here I am with Sarah Jane. Hey I am Sarah Ellen. 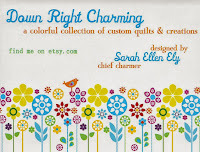 Her fun designs are produced on fabric by Michael Miller. She has a sweet website. And this is Susan Emory. Her new Swirly Girls collection is called Summer Lovin' and it is fun. Here I am with my friend Emily Herrick. Her new collection is called Up and Away, It has hot air balloons on some of the fabric. Her company is called Crazy Old Ladies. LOL! Look at all these beautiful flowers in the Michael Miller display. They won a best booth award. Here is Jaybird. Well her real name is Julie Herman Kaplan and she is really super nice. She gave me a quilty coloring book, We carry a lot of her patterns. Here they are. Me and My Sister. No not my sister. They are sisters. Barb and Mary. I love all their bright fabric. I make a lot of quilts from their collections. I just ran into Kelly Ann. She owns a cute shop in Warrenton, Virginia. Guess what it is called? Kelly Ann's Quilting. She is good friends with Susan too. 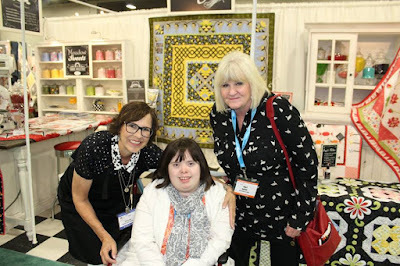 Here I am at the American Patchwork & Quilting booth. They all know me from the stories they write about us. This is Lisa Schumacher. Oh this is important. Get your calendars out. The next pillowcase sew-in will be September 16-17th. Watch our shop website for details. We love sew-a-thons. I think we will hit 5,000 cases at the end of this weekend. Wow. An entire Grunge booth. Good job Moda. We love Grunge. This photo is very special. Polly Kirton (Kristen's mom), Jennifer Keltner, my mom and me. Without this team, we would not have the shop that we have. My mom gets very emotional when she talks about it. We are so lucky to know each other. Here I am in the Moda booth. It is called Camp Moda this year. I like it. And here he is...Moda Mark. I usually see him at our shop but today he is right here. This is funny. Here I am wearing Kate Spain's new collection. It is called Grand Canal. I love it! Kate can't be here because she is at Surtex in New York. I miss her. But I love having Polly with me. She is like my other mom. I think Kristen is happy to share her with me. We will never forget Kristen. Not ever. Oh this is a good one. We hardly ever get a picture of the three of us. Here is my friend Jill Finley. Her company is called Jillily Studios. Her booth won Best of Show! She has been very brave this year battling breast cancer. 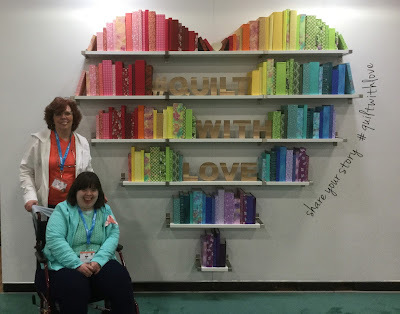 Now here is something really special about being at quilt market. I introduced Polly to Jill. Polly works three days a week in the gift shop at Huntsman Cancer Institute where Kristen had her bone marrow transplant and that is where Jill is getting her treatment too. So now they know each other and can say hi. That makes me happy. I think it makes Kristen happy too. It's time for the Moda dinner. They turned the ballroom into Camp Moda. Look how cute this decoration is. It is like a s'more. And that is why I am wearing my Girl Scout camp shirt. Look who is here. It is Moda Mark. He is everywhere. Yummy! This chicken is so good!! Time for a dinner selfie. My mom is wearing her new glasses. She only brings them out at night. Look who I ran into. It is Mabel and Ethel. Well really Debbie and Jackie. They own the quilt shop in Sandusky, Ohio called...are you ready for it...Mabel and Ethel's Quilt Shoppe. They were just named a top ten Sampler shop. Well it is time to go to bed. This was a very fun party. Here is my new friend Joy Ansell. She works for Moda. I like making new friends. Hey that's a camp song...Make new friends, but keep the old, some are silver and some are gold. First stop is with David Garrettson. He is our rep for Robert Kaufman Fabrics. I love this boat fabric from Ann Kelle. So I bought it. All of it because it will make a cute quilt. And look at this. Little Kukla!!! Oh I really love this. I am going to make pillowcases for all of my little Ukranian friends with this. I bought every color. That's how much I like it. Here I am on my friend Jane's couch. She is pulling out something special just for me. She is so incredibly nice. She comes to market all the way from Australia. She and her friend Franny have designed this new collection called Manderley. It is beautiful. Oh my goodness, look at what she has for me. It is like fabric origami. And look at this darling little quilt. It has fish on it. Jane gave me the pattern for it so I can make one too. Hey Mom, Slow down. Look at this. I see Kate's new collection in this quilt. This one too. They are both patterns made by Coach House Designs. Oh my this is good. We come all the way from Cleveland to Utah to see our friends from Cleveland! Hi Kay and Michele. Oh I love this heart. It says #quilt with love. I always do! Beep, beep! This booth is just too cute. We are over in the Riley Blake section now. This is Keep on Groovin' by the Sugar Sisters. Lots of cute things over here. Like Mabel or is that Ethel? And Crayola Crayons. Fabric style. Here I am chatting with Lori Holt. She is the Bee in My Bonnet lady. Shhh...I think she is going to give me a book. Score! 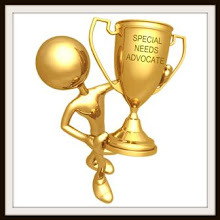 If you haven't been to her blog please click over there now. 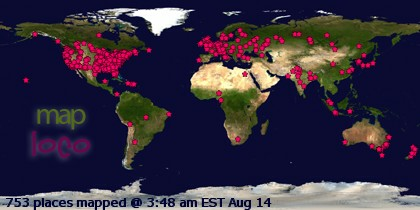 It is so buzzing! Mom, Seriously it is not Christmas. Why are we stopping here? Oh because it is so cute!! Pixie Noel by Tasha Noel. Really? Yep really. Hop on over to her blog too. So stinkin cute! It is time for us to go. Polly is going to pick us up at the hotel to take us up to see a little friend who is in Primary Children's Hospital. See you tomorrow. It's my friend Kori. She owns the most adorable store in Ohio called Olive Grace Studios. One time when I went there I saw a really huge hog. You have to go. Her shop is in a one room schoolhouse. You will love it. She designs patterns too. Here we are in the Abbey Lane booth. This is Marcea Owen. She always remembers me and has lots of fun patterns. My mom really loved those little minis on the wall behind us. Oh speaking of minis...these little patterns from Martingale are really super cute. Meet Corey Yoder. I am meeting her for the first time too. She is a Moda designer and really super nice. Her new collection is called Sundrops. You can see more on her darling blog Coriander Quilts. If my Grandma was here with me she would love this quilt. This kitty looks just like Jasman. That was her cat. Here I am in front of Grand Canal. I really like the colors Kate selected. And here is a fun tidbit. One of my favorite quilt designers helped Kate with this quilt. Her name is Crystal Stanworth. She goes by Frivolous Necessity and she designed our quilt when we were named a top ten shop in Quilt Sampler. She thinks I am a good photographer. Elizabeth Hartman does it again. This time with butterflies. Her colors are just perfect. Oh look who I found. This is Aila. Her mom has a quilting business. She also has a big brother with Down syndrome. Oh babies are so fun. I love them so much. Even when they grab my face. Silly girl. And Dory! I love Dory too. OMG can you believe the fabric. Camelot Fabrics has licensed Dory. I can't wait to sew with this. I bet Dory will be coming back to Disney on Ice soon. And I will be there. Welp, that's it folks. 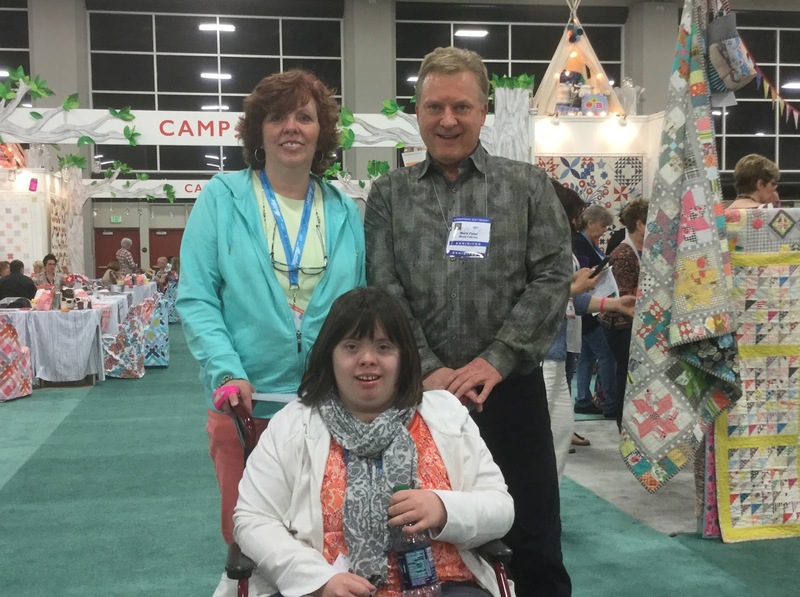 Quilt Market 2016 has come to an end. Hope to see you next year in St. Louis. Oh Leah...are you coming with us?